This is a gateway for print poets into the e-poetry world, helping them translate their poetic text into a 3-dimensional, multi-linear an recombining format. The cube consists of four sides top, bottom, front, and back. 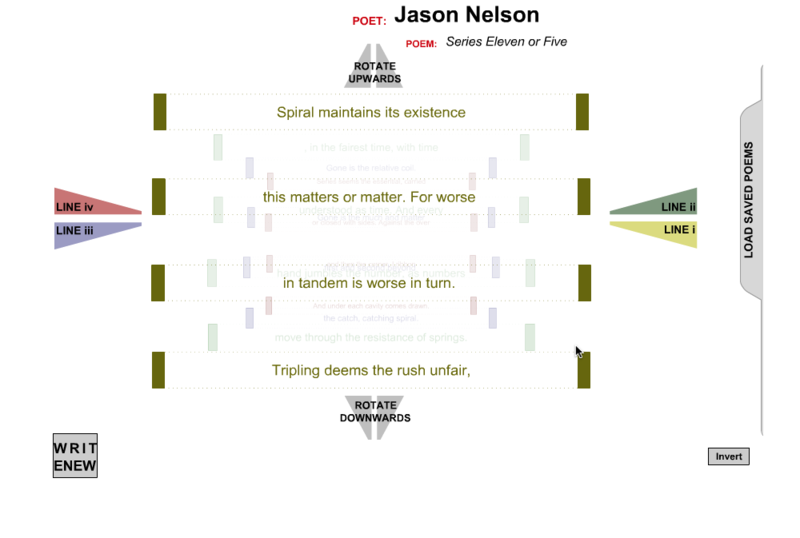 Between each of this esides are four stanzas, or four sets of four lines. The poet writes a 16 line poem and enters it into the form. Thoe lines are then automatically entered into the cube and can be saved into the database. When writing a poem for this cube, the poet must think of how the poem will fit and the recombine in the cube. As you turn the cube, the lines move as well. For example the 1st, 5th, 9th and 13th lines form the top of the cube, with the shallow meiddle, deep middle and the back lines changing as well.